Laura Mann's eLearning Tales and Trails - Where have I been? A look at and reflections of my experiences with eLearning. Join the conversation by adding a comment! I have memories of despising the typing class in Grade 9. I loathed that I had to use certain fingers to tap certain keys. Even more though, I was frustrated that there was no meaning behind the finger/key connection. My favourite class in school was English and I wanted to write stories. I had stories to tell and my teenaged-brain refused to find any value in what my Grade 9 typing teacher had to say. My adult brain is more relaxed and might have told my teenaged brain to save the anger for something more meaningful. However, my 14 year old self had a point: learners must be engaged and feel the work they do is meaningful in some context. I had a friend who loved typing class. Her goal was to become a secretary and loved increasing her WPM and thought the best way to do so was to learn which finger went with which key. It was meaningful to her and made sense in her big picture. I have no idea if I use the correct finger/key connections to this day. I like centering myself with the bumps on the F and J, though. Perhaps this is my Typing 9 teacher's legacy to me. 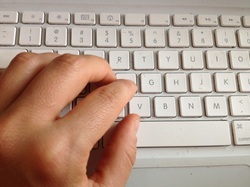 I type fast when I need to or one-fingered if necessary. I don't make spelling mistakes because the red underlines drive me nuts. I write for meaning. This is a reminder to me to help my students find meaning in their work and change the direction if it is not there.